New Delhi: Delhi High Court today asked the city government to respond to a plea seeking quashing of its executive orders that made Unique Identification Authority of India (UIDAI) or ‘Aadhaar’ compulsory for availing various public services here. Justice Rajiv Shakdher issued the notice to the Delhi government on a plea of Ashutosh Chandola that Aadhaar card, which was made optional by the Planning Commission, has now been made mandatory for availing benefits and public services in the national capital. “Issue a writ in the nature of certiorari to quash executive orders…passed by the Delhi Government vide which Aadhaar has been mandatory for availing all public services from the Government of NCT of Delhi,” the petition said. It also said a direction be given to the government to accept other identity and address proofs such as voter I-Card, passport and other documents, prescribed by the Central Motor Vehicles Rules, for availing public services in Delhi. 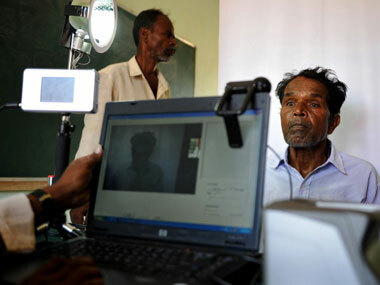 The plea claimed that the Aadhar which is supposed to be optional has been made compulsory. AFP. “The entire (Aadhaar) project (of Planning Commission) is meant to be voluntary in nature and this is reflected in the Aadhaar enrolment form which clearly mentions that the Aadhaar enrolment is free and voluntary,” it said.